Bacterial image of Isaac Newton photosynthetically grown on the glass surface of the bottom of a petri dish using aqueous media. The Photosynthetic bacteria were cultivated and isolated in the artist’s studio laboratory, from winogradsky columns made up from garden samples of organic materials. 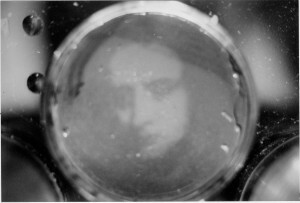 The image used was taken from the NPG’s Godrey Kneller portrait of Newton, and by using transparent acetate masks with lightboxes, the image was grown in 21 hours. This post was submitted by Roy Amiss.